"I eat pretty healthy, but I never lose any weight!" Haven't we all said that? The truth is there are foods and sneaky ingredients that sabotage your diet. They add calories quickly, cause you to feel even more hungry, and provide no little or no nutritional value! They are the Sabotaging S's of Skinny. Sugar is the first culprit. It is found in nearly everything from cereals to drinks, sauces and desserts. Sugar is also known for inducing or creating cravings. Like Mike Myers said in Austin Powers, "It's a vicious cycle!" Sugar comes in at 110 calories per ounce. 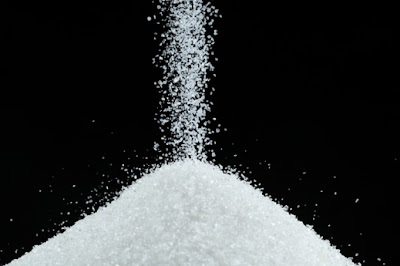 The average American consumes 156 pounds of sugar a year. That is 274, 560 calories from sugar. A whopping 78 pounds of sugar on or off of you a year! Salt(Sodium) is diet destroyer #2. Do you salt your food before you even try it? Don't lie. Chances are there is already plenty of salt in that dish. Salt, like sugar, is found in EVERYTHING! It is labeled as salt, sodium, MSG, or preservatives. Our bodies only need about 1 teaspoon (2,000 mg) of salt a day. Go grab a teaspoon and see how small that is....I'll wait....Crazy right! Have you ever noticed when eating salty foods, like chips, you are thirsty. Salt absorbs water and pulls it our of the cells in your body. This tells your brain that you are thirsty. A typical response to that is 1) drink something 2) eat something. Salt like sugar leaves us craving more and more. That is dangerous because salt has been shown to increase the risk of high blood pressure, heart disease, and stroke. Solid Fat is the most obvious sabotager of skinny. Because it is visible. Solid fats are seen in meat and as grease bubbles in soup. It is also the white stuff that separates from the food when it is in the fridge. At least it is easily removed....seriously this is a great way to take out the fat! It is even proudly on display in your butter dish. Solid fat is any fat that is solid at room temperature. Click here to see a list of solid fats. They are categorized as saturated fat or trans fat on nutrition labels. The great part is that they can be removed and avoided. You can trim the fat off beef or chicken. You can cook or bake with healthier alternatives like olive oil or canola oil. If you switch your 2% milk for fat-free milk you save calories and fat, but still get all the nutritional benefits. Try to remove the solid fats from your diet replace them with healthy fats like those found in fish, olive oil, avocados, or nuts. Soda is quite possibly the worst! It has the tri-fecta of sabotagers. Sugar (or sweeteners), sodium, and it is a stripped source that provides NO nutritional value. Whether it is regular or diet, light or dark, bottled or canned it needs to go. One can of regular soda is 150 calories and provides only extra weight and regret in return. One container = one serving...right? Don't think diet soda gets off easy. The artificial sweetener labeled as sucralose will not be processed in your body (it cannot, you just pee it out), but it will still activate that desire for a sweet treat. What an added bonus! Soda does not hydrate you either. 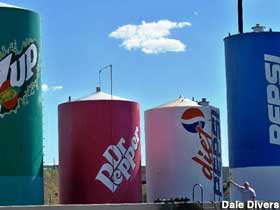 In fact, it does quite the opposite leaving you thirsty for more of anything....usually soda. It does not benefit you in anyway. It leaves you feeling bloated and craving anything sugary or salty. Drop the soda and grab water. Sauces are so stinking popular today. We make sauces for EVERY kind of food. We have salad dressings, ketchup, BBQ sauce, and mayonnaise to name a few. A friend of mine recently said, "You mean I have to count ketchup and BBQ sauce in my calories?" Unfortunately, YES! They have calories. They count. Am I saying you should give up sauces completely? Maybe. You need to make that decision. Many of us sauce everything from our breakfast in the morning to our ice cream at night. Take a day to exam what "sauces" you put on your food. Figure out the calories. You will be amazed at how many calories you consume in sauce form. You won't sabotage your skinny when you cut the sauces down or out. Stripped sources of food stink. This means the nutritional value (vitamins, nutrients, minerals) has been removed for taste, color, or packaging purposes. Think white bread! Wheat is not white. It is brown. Wheat has 3 parts- bran, germ, and endosperm. Together they make up a whole grain. This whole grain has fiber, nutrients, and carbohydrates. 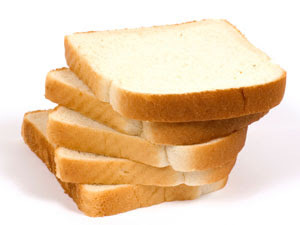 White bread has starch. You are basically eating a potato in bread form. Manufacturer's do this with a variety of foods. They remove the "good stuff" and give us the cheapest and most easily processed form of that product. Some add vitamins and nutrients back into the food. You see this labeled as "enriched" or "fortified". Hello, they are just putting back what should be there in the first place. This one is tough because it is so prevalent. My tip is to buy as much produce as you can. Buy meats from the deli or meat market, not the freezer section. If you buy processed food read the ingredient labels closely. Learn and look for keywords like bleached, enriched, and fortified and avoid them at all cost. "Skinny", rather, healthy is our real goal. To achieve and maintain health we need to know what to look out for in our food. These Sabotaging S's aren't always apparent. Be intentional about what you eat and be sure to check the recipe or label. Health is hard and I don't want any of these stupid S's ruining my health or yours. Can you think of any other "S" foods that sabotage skinny? Have each blog post send directly to your e-mail by subscribing!